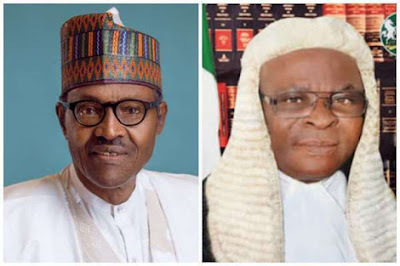 The Nigerian government has reacted to the position of both the United States of America and her United Kingdom counterpart on the suspension of the country’s Chief Justice, Walter Onnoghen. A statement by Garba Shehu, the senior special assistant on media and publicity to President Muhammadu Buhari, said as much as Nigeria welcomes interests and partnerships for a successful 2019 general elections, the government would not condone unfair interference in the country’s internal affairs. Following the controversies generated by the suspension of Mr. Onnoghen by President Muhammadu Buhari on Friday and the appointment of a successor in acting capacity, the United States, the United Kingdom and other foreign institutions issued statements advising the government to retrace its steps. Before their latest statements on the suspension of the chief justice of Nigeria, the US and the UK had earlier on Thursday threatened to ban from entering their countries any Nigerian who instigated violence or engaged in rigging of the forthcoming elections. The Peoples Democratic Party (PDP) and the Coalition of United Political Parties (CUPP) had hailed what they described as the foreign nations’ timely intervention. But the Federal Government on Saturday night strongly condemned the comments of the foreign countries on the suspension of the CJN, insisting that as a sovereign country, Nigeria deserves respect and honour. The government, however, pledged its commitment to ensuring a free, fair, credible and peaceful election, saying the electoral umpire, that is, the Independent National Electoral Commission (INEC), has been made truly independent and offered the required support. The government statement came shortly after an Islamic socio-political group, Muslim Rights Concern (MURIC), attacked both the U.S. and the U.K. over their positions on the suspension of the CJN. MURIC accused the two western countries of being too quick to make statements on the suspension without raising their voices against what it described as the weighty allegations against the CJN. The statement by Mr. Shehu reads in part; “Nigeria reserves the right to be insulated from suggestions and or interference with respect to wholly internal affairs and commends international laws, customs and norms that mandate and require nations and the comity to respect this prerogative to all. “Nigeria is confident of its electoral processes and her preparation for the imminent elections and the federal government has supported the independent electoral umpire in both its independence and resources needed to accomplish our desire and insistence on free and fair elections. “In addition, the Federal government has ensured the independence of all organs, institutions and arms of government to perform their functions in a manner that is transparent and is not lacking in integrity whether institutionally or by persons within such institutions or organs and will continue to do this. Meanwhile, MURIC in its own statement, which was signed by its Director, Ishaq Akintola, advised both the U.S. and the U.K. or any other foreign interest not to look at Mr Onnghen’s suspension in isolation but consider the gravity of the offence allegedly committed by the embattled CJN. The statement reads in part; “Western countries should not just jump to conclusions. They should not just make it look as if the CJN is being suspended to clear the way for some undemocratic practices. Neither the US nor Britain will allow a judge to accumulate wealth illegally because it is dangerous for the judicial system. Heavy cash lodgements in both foreign and local currencies were allegedly found in the former CJN’s accounts. No responsible government will ignore that. “While we appreciate the interest of US and UK in evolving healthy democracies around the world, particularly in Nigeria, we will appreciate it more if these countries show equal concern for Nigeria’s war against corruption, particularly in the judiciary and in the repatriation of Nigeria’s looted funds in those two countries. Advanced democracies are not under any special obligation to listen only to the opposition and echo its propaganda. They also owe it a moral duty to hear the government’s side before making policy statements. “To this end, we expect that both the US and UK will equally show interest in the allegation bordering on corruption made against the former CJN as they have expressed concern over his suspension. This ought to be done against the backdrop of the reputation of Nigeria which a former British prime minister described as ‘fantastically corrupt’ but which the present regime of President Muhammadu Buhari is trying hard to turn around. “It is a known fact that no war against corruption can succeed if the judiciary is corrupt. It is the robust judicial system which both the US and UK enjoy today that allows a conducive atmosphere for democratic principles of rule of law, liberty and justice. MURIC cited the cases of the former Governors of both Delta and Bayelsa States, James Ibori and Diepreye Alamieyeseigha respectively, which it said mesmerized the Nigerian judiciary but was successfully prosecuted abroad. The statement added; “We must ask Britain if it can tolerate what is happening in Nigeria today on her own soil. For instance, the current British Lord Chief Justice, Sir John Thomas, earns £240,000 per annum. “Will Theresa May, the Prime Minister, keep mum if he receives a report that his Lord Chief Justice has five bank accounts with more than $500,000 in each?